This article is about Americans with ancestry from India. For the indigenous peoples also known as North American Indians, see Native Americans in the United States. Indian Americans or Indo-Americans are Americans whose ancestry belongs to any of the many ethnic groups of the Republic of India. The U.S. Census Bureau uses the term Asian Indian to avoid confusion with the indigenous peoples of the Americas commonly referred to as American Indians (or Native Americans or Amerindians). In the Americas, historically, the term "Indian" has been most commonly used to refer to the indigenous people of the continents after European colonization in the 15th century. Qualifying terms such as "American Indian" and "East Indian" were and are commonly used to avoid ambiguity. The U.S. government has since coined the term "Native American" to refer to the indigenous peoples of the United States, but terms such as "American Indian" remain popular among both indigenous and non-indigenous populations. Since the 1980s, Indian Americans have been categorized as "Asian Indian" (within the broader subgroup of Asian American) by the United States Census Bureau. While "East Indian" remains in use, the term "South Asian" is often chosen instead for academic and governmental purposes. Indian Americans are a subgroup of South Asian Americans, a census group that also includes Bangladeshi Americans, Bhutanese Americans, Nepalese Americans, Pakistani Americans, Burmese Americans, Sri Lankan Americans, etc. Beginning in the 1600s the East India Company begins bringing indentured Indian servants to American colonies. In 1680, due to anti-miscegenation laws, a mixed-race girl born to an Indian father and an Irish mother is classified as 'mulatto' and sold into slavery. The Naturalization Act of 1790 made Asians ineligible for citizenship, with citizenship limited to whites only. First significant wave of Indian immigrants enter America, with more than two thousand Indian Sikhs living in the United States, primarily in California, by the end of the century. They find work on farms and on lumber mills in the states of California, Oregon, and Washington. Many Punjabi Sikhs settle in California, around the Yuba City area, forming close ties with Mexican Americans. The presence of Indian-Americans also helped develop interest in Eastern religions in the US and would result in its influence on American philosophies such as Transcendentalism. Swami Vivekananda arriving in Chicago at the World's Fair led to the establishment of the Vedanta Society. Bhicaji Balsara became the first known Indian-born person to gain naturalized U.S. citizenship. As a Parsi, he was considered a 'pure member of the Persian sect' and therefore a free white person. The judge Emile Henry Lacombe, of the Southern District of New York, only gave Balsara citizenship on the hope that the United States attorney would indeed challenge his decision and appeal it to create “an authoritative interpretation” of the law. The U.S. attorney adhered to Lacombe's wishes and took the matter to the Circuit Court of Appeals in 1910. The Circuit Court of Appeal agreed that Parsees belong to the white race and were "as distinct from Hindus as are the English who dwell in India”. Prior to 1965, Indian immigration to the U.S. was small and isolated, with fewer than fifty thousand Indian immigrants in the country. The Bellingham riots in Bellingham, Washington on September 5, 1907 epitomized the low tolerance in the U.S. for Indians and Sikhs who were called hindoos by locals. While anti-Asian racism was embedded in U.S. politics and culture in the early 20th century, Indians were also racialized for their anticolonialism, with U.S. officials, casting them as a "Hindu" menace, pushing for Western imperial expansion abroad. Although labeled Hindu, the majority of Indians were Sikh. In the 1923 case, United States v. Bhagat Singh Thind, the Supreme Court ruled that Punjabis were not "white persons" and were therefore racially ineligible for naturalized citizenship. The Court also argued that the racial difference between Indians and whites was so great that the "great body of our people" would reject assimilation with Indians. After the Luce–Celler Act of 1946 a quota of 100 Indians per year were permitted to immigrate to the U.S. and become citizens. The Immigration and Nationality Act of 1965 dramatically opened entry to the U.S. to immigrants other than traditional Northern European groups, which would significantly alter the demographic mix in the U.S. Not all Indian Americans came directly from India; some came to the U.S. via Indian communities in other countries, including the United Kingdom, Canada, (South Africa, the former British colonies of East Africa, (namely Kenya, Tanzania), and Uganda, Mauritius), the Asia-Pacific region (Malaysia, Singapore, Australia, Fiji), and the Caribbean (Guyana, Trinidad and Tobago, Suriname, and Jamaica). India Square, in the heart of Bombay, Jersey City, New Jersey, US, home to the highest concentration of Asian Indians in the Western Hemisphere, is one of at least 24 Indian American enclaves characterized as a Little India which have emerged within the New York City Metropolitan Area, with the largest metropolitan Indian population outside Asia, as large-scale immigration from India continues into New York. According to the 2010 United States Census, the Asian Indian population in the United States grew from almost 1,678,765 in 2000 (0.6% of U.S. population) to 2,843,391 in 2010 (0.9% of U.S. population), a growth rate of 69.37%, one of the fastest growing ethnic groups in the United States. The New York-Newark-Bridgeport, NY-NJ-CT-PA Combined Statistical Area, consisting of New York City, Long Island, and adjacent areas within New York, as well as nearby areas within the states of New Jersey (extending to Trenton), Connecticut (extending to Bridgeport), and including Pike County, Pennsylvania, was home to an estimated 711,174 uniracial Indian Americans as of the 2017 American Community Survey by the U.S. Census Bureau, comprising by far the largest Indian American population of any metropolitan area in the United States; New York City itself also contains by far the highest Indian American population of any individual city in North America, estimated at 246,454 as of 2017. Monroe Township, Middlesex County, in central New Jersey, the geographic heart of the Northeast megalopolis, has displayed one of the fastest growth rates of its Indian population in the Western Hemisphere, increasing from 256 (0.9%) as of the 2000 Census to an estimated 5,943 (13.6%) as of 2017, representing a 2,221.5% (a multiple of 23) numerical increase over that period, including many affluent professionals and senior citizens. In 2014, 12,350 Indians legally immigrated to the New York-Northern New Jersey-Long Island, NY-NJ-PA core based statistical area; As of January 2019, Indian airline carrier Air India as well as United States airline carrier United Airlines were offering direct flights from the New York City Metropolitan Area to and from Delhi, Mumbai, and (Air India) Ahmedabad. At least twenty Indian American enclaves characterized as a Little India have emerged in the New York City Metropolitan Area. Other metropolitan areas with large Indian American populations include Atlanta, Baltimore–Washington, Boston, Chicago, Dallas–Ft. Worth, Detroit, Houston, Los Angeles, Philadelphia, and San Francisco–San Jose–Oakland. The three oldest Indian-American communities going back to around 1910 are in lesser populated agricultural areas like Stockton, California south of Sacramento; the Central Valley of California like Yuba City; and Imperial County, California aka Imperial Valley. These were all primarily Sikh settlements. In 2006, of the 1,266,264 legal immigrants to the United States, 58,072 were from India. Between 2000 and 2006, 421,006 Indian immigrants were admitted to the U.S., up from 352,278 during the 1990–1999 period. According to the 2000 U.S. census, the overall growth rate for Indians from 1990 to 2000 was 105.87 percent. The average growth rate for the U.S. was 7.6 percent. Indians comprise 16.4 percent of the Asian-American community. In 2000, the Indian-born population in the U.S. was 1.007 million. According to the U.S. Census Bureau, between 1990 and 2000, the Indian population in the U.S. grew 130% – 10 times the national average of 13%. Indian Americans are the third largest Asian American ethnic group, following Chinese Americans and Filipino Americans. A joint Duke University – UC Berkeley study revealed that Indian immigrants have founded more engineering and technology companies from 1995 to 2005 than immigrants from the UK, China, Taiwan and Japan combined. The percentage of Silicon Valley startups founded by Indian immigrants has increased from 7% in 1999 to 15.5% in 2006, as reported in the 1999 study by AnnaLee Saxenian  and her updated work in 2006 in collaboration with Vivek Wadhawa. Indian Americans are making their way to the top positions of almost every big technology company (Google, Facebook, Microsoft, Cisco, Oracle, Adobe, Softbank, Cognizant, Sun microsystems, etc.) Many of them came from very humble origins, for example the current google CEO "Sundar Pichai did not have the privilege of watching television or travelling by car during his childhood. Born and raised in a middle class household, Mr. Pichai used to sleep with his brother in the living room of their two-room apartment that barely had any technology. Despite facing these hardships of everyday life in India, Pichai had a gleam in his eyes of sheer ambition and relentless pursuit." A recent study shows that 23% of Indian business school graduates take a job in United States. In 2014, the Pew Research Center published an article listing some more interesting facts about Indian Americans. Amartya Sen, Nobel Memorial Prize in Economic Sciences, 1998. Manjul Bhargava, Professor of mathematics at Princeton University and winner of Fields Medal, 2014. Indian Americans continuously outpace every other ethnic group socioeconomically per U.S. Census statistics. Thomas Friedman, in his 2005 book The World Is Flat, explains this trend in terms of brain drain, whereby the best and brightest elements in India emigrate to the US in order to seek better financial opportunities. Indians form the second largest group of physicians after non-Hispanic whites (3.9%) as of the 1990 survey, and the percentage of Indian physicians rose to around 6% in 2005. According to Pew Research in 2015, of Indian Americans aged 25 and older, 32% had obtained a bachelor's degree and 40% had obtained a postgraduate degree, whereas of all Americans, 19% had obtained a bachelor's degree and 11% had obtained a postgraduate degree. The median household income for Indian immigrants in 2015 was much higher than that of the overall foreign- and native-born populations. Households headed by Indian immigrants had a median income of $101,591, compared to $51,000 and $56,000 for overall immigrant and native-born households, respectively. By far they are the richest and most successful ethnic group in the USA due to their strong work-ethic and focus on education, as well as many other factors, such as the relatively low wages for highly skilled workers in India, creating an incentive for highly skilled Indians to immigrate, while poorer Indians can neither afford to immigrate, nor live in the United States. Approximately 7 percent of Indian immigrants lived in poverty in 2015, a much lower rate than the foreign-born population overall and the U.S. born (17 percent and 14 percent, respectively). Norah Jones is an American singer, songwriter, and actress. Hindi radio stations are available in areas with high Indian populations, for example, Easy96.com in the New York City metropolitan area, KLOK 1170 AM in San Francisco, RBC Radio; Radio Humsafar, Desi Junction in Chicago; Radio Salaam Namaste and FunAsia Radio in Dallas; and Masala Radio, FunAsia Radio, Sangeet Radio, Radio Naya Andaz in Houston and Washington Bangla Radio on Internet from the Washington DC Metro Area. There are also some radio stations broadcasting in Tamil and Telugu within these communities. Houston-based Kannada Kaaranji radio focuses on a multitude of programs for children and adults. In South Florida, Bhawan R. Singh has hosted an Indo-Caribbean/Indian Hindustani radio program called Sangeet Mala on WHSR 980 AM on Saturdays. AVS (Asian Variety Show) and Namaste America are nationally available South Asian programming available free to air and can be watched with a television antenna. Several cable and satellite television providers offer Indian channels: Sony TV, Zee TV, TV Asia, Star Plus, Sahara One, Colors, Big Magic, regional channels, and others have offered Indian content for subscription, such as the Cricket World Cup. There is also an American cricket channel called Willow. Many metropolitan areas with large Indian-American populations now have movie theaters which specialize in showing Indian movies, especially from Bollywood and Telugu cinema. In 2012, the film Not a Feather, but a Dot directed by Teju Prasad, was released which investigates the history, perceptions and changes in the Indian-American community over the last century. In popular media, several Indian-American personalities have made their mark in recent years, including Kovid Gupta, Kal Penn, Aziz Ansari, Hasan Minhaj, and Mindy Kaling. BAPS Shri Swaminarayan Akshardham, New Jersey, one of the largest Hindu temples. Communities of Hindus, Christians, Muslims, Sikhs, Jains, Buddhists, Parsis, and Indian Jews have established their religions in the United States. According to 2012 Pew Research Center research, 51% consider themselves Hindu, 18% as Christian (Protestant 11%, Catholic 5%, other Christian 3%), 10% as unaffiliated, 10% as Muslims, 5% as Sikh, 2% as Jain. The first religious center of an Indian religion to be established in the US was a Sikh Gurudwara in Stockton, California in 1912. Today there are many Sikh Gurudwaras, Hindu temples, Christian churches, and Buddhist and Jain temples in all 50 states. Some have claimed that as of 2008, the American Hindu population was around 2.2 million, but this estimation is based on the flawed assumption that percentage of Hindus among Indian Americans is the same as in India. Regardless, Hindus are the majority of Indian Americans. Many organizations such as ISKCON, Swaminarayan Sampraday, BAPS Swaminarayan Sanstha, Chinmaya Mission, and Swadhyay Pariwar are well-established in the U.S. Hindu Americans have formed the Hindu American Foundation which represents American Hindus and aim to educate people about Hinduism. Swami Vivekananda brought Hinduism to the West at the 1893 Parliament of the World's Religions. The Vedanta Society has been important in subsequent Parliaments. Today, many Hindu temples, most of them built by Indian Americans, have emerged in different cities and towns in the United States. More than 18 million Americans are now practicing some form of Yoga. Kriya Yoga was introduced to America by Paramahansa Yogananda. A.C Bhaktivedanta Swami Prabhupada initiated the popular ISKCON, also known as the Hare Krishna movement, while preaching Bhakti yoga. There are nearly 30 million Sikhs around the world today, and a vast majority of them live in the Indian state of Punjab. There is also a robust and flourishing diaspora, with communities large and small all over the globe. Much of the diaspora is concentrated in the commonwealth due to migration within the British empire, yet Sikhs continue to establish themselves in various countries throughout the world. From the time of their arrival in the late 1800s, Sikh men and women have been making notable contributions to American society. In 2007, there were estimated to be between 250,000 and 500,000 Sikhs living in the United States, with largest populations living on the East and West Coasts, together with additional populations in Detroit, Chicago, and Austin. The United States also has a number of non-Punjabi converts to Sikhism. Sikh men are typically identifiable by their unshorn beards and turbans (head coverings), articles of their faith. Many organisations like World Sikh Organisation (WSO), Sikh Riders of America, SikhNet, Sikh Coalition, SALDEF, United Sikhs, National Sikh Campaign continue to educate people about Sikhism. There are many "Gurudwaras" Sikh temples present in all states of USA. Adherents of Jainism first arrived in the United States in the 20th century. The most significant time of Jain immigration was in the early 1970s. The US has since become a center of the Jain diaspora. The Federation of Jain Associations in North America is an umbrella organization of local American and Canadian Jain congregations. Unlike India and United Kingdom, the Jain community in United States doesn't find sectarian differences, Both Digambara and Śvētāmbara a share common roof. There are many Indian Christian churches across the US; Church of South India, Church of North India, Syro-Malabar Catholic Church, Syro-Malankara Catholic Church, Christhava Tamil Koil, Knanaya, Indian Orthodox Church, Mar Thoma Church (reformed orthodox), Malankara Syriac Orthodox Church, The Pentecostal Mission, Assemblies Of God, Church of God, Sharon Pentecostal Church, Independent Non Denominational Churches like Heavenly Feast, Plymouth Brethren, and the India Pentecostal Church of God. Saint Thomas Christians from Kerala have established their own places of worship across the United States. The website USIndian.org has collected a comprehensive list of all the traditional St. Thomas Christian Churches in the US. There are also Catholic Indians hailing originally from Goa, Karnataka, and/or Kerala, who attend the same services as other American Catholics, but may celebrate the feast of Saint Francis Xavier as a special event of their identity. The Indian Christian Americans have formed the Federation of Indian American Christian Organizations of North America (FIACONA) to represent a network of Indian Christian organizations in the US. FIACONA estimates the Indian American Christian population to be 1,050,000. The large Parsi community is represented by the Federation of Zoroastrian Associations of North America. Indian Jews are perhaps the smallest organized religious group among Indian Americans, consisting of approximately 350 members in the US. They form the Indian Jewish Congregation of USA, with their headquarters in New York City.Indian Muslim Americans generally congregate with other American Muslims, including those from Pakistan and Bangladesh, but there are prominent organizations such as the Indian Muslim Council - USA. Nina Davuluri, Miss America 2014 "first contestant of Indian descent to win the Miss America Competition"
Like the terms "Asian American" or "South Asian American", the term "Indian American" is also an umbrella label applying to a variety of views, values, lifestyles, and appearances. Although Asian-Indian Americans retain a high ethnic identity, they are known to assimilate into American culture while at the same time keeping the culture of their ancestors. The United States is home to various associations that promote Indian languages and cultures. Some major organizations include Telugu Association of North America (TANA), American Telugu Association (ATA), Federation of Tamil Sangams of North America, Federation of Kerala Associations in North America, Association of Kannada Kootas of America (AKKA), North American Bengali Conference, Orissa Society of the Americas, and Maharashtra Mandal. 1899–1914: First significant wave of Indian immigrants, mostly Sikh farmers and businessmen from Punjab region of British India, start arriving in California (Angel Island) on ships via Hong Kong. They founded industry, farms, and lumber mills in the states of California, Oregon, and Washington. 1912: The first Sikh temple opens in Stockton, California. 1913: A.K. Mozumdar became the second Indian-born person to earn U.S. citizenship, having convinced the Spokane district judge that he was "Caucasian" and met the requirements of naturalization law that restricted citizenship to free White persons. In 1923, as a result of a U.S. Supreme Court decision that no person of East Indian origin could become a naturalized American citizen, his citizenship was revoked. 1917: The Barred Zone Act passes in Congress through two-thirds majority, overriding President Woodrow Wilson's earlier veto. Asians, including Indians, are barred from entering the United States. 1918: Due to anti-miscegenation laws, there was significant controversy in Arizona when an Indian farmer B. K. Singh married the sixteen-year-old daughter of one of his White American tenants. 1918: Private Raghunath N. Banawalkar is the first(?) Indian-American recruited into the US Army on February 25, 1918 and serves in the Sanitary Detachment of the 305th Infantry Regiment, 77th Division, American Expeditionary Forces in France. Gassed while on active service in October 1918 and subsequently awarded Purple Heart medal. 1922: Yellapragada Subbarao, an Andhraite from Andhra Pradesh in Southern India arrived in Boston on October 26, 1922. He discovered the role of phosphocreatine and adenosine triphosphate (ATP) in muscular activity, which earned him an entry into biochemistry textbooks in the 1930s. He obtained his Ph.D the same year, and went on to make other major discoveries; including the synthesis of aminopterin (later developed into methotrexate), the first cancer chemotherapy. 1943: Republican Clare Boothe Luce and Democrat Emanuel Celler introduce a bill to open naturalization to Indian immigrants to the United States. Prominent Americans Pearl Buck, Louis Fischer, Albert Einstein and Robert Millikan give their endorsement to the bill. President Franklin D. Roosevelt, a Democrat, also endorses the bill, calling for an end to the "statutory discrimination against the Indians". 1946: President Harry Truman signs into law the Luce-Celler Act of 1946, returning the right to Indian Americans to immigrate to the United States and become naturalized citizens. 1956: Dalip Singh Saund elected to the US House of Representatives from California. He was re-elected to a second and third term, winning over 60% of the vote. He is also the first Asian immigrant from any country to be elected to Congress. 1962: Zubin Mehta appointed music director of the Los Angeles Philharmonic, becoming the first person of Indian origin to become the principal conductor of a major American orchestra. Subsequently, he was appointed principal conductor of the New York Philharmonic. 1975: Launch of India-West, a leading newspaper covering issues of relevance to the Indian-American community. 1989: Rohit Jagessar, an Indo-Guyanese founded RBC Radio, the first Asian Indian radio station in the US and India's first Satellite radio. 1999: Filmmaker M. Night Shyamalan enters film history with his film The Sixth Sense becoming one of the all-time highest-grossing films worldwide. 2002: Professor Calyampudi Radhakrishna Rao — 'the world-renowned statistician' is awarded National Medal of Science by President George W. Bush. 2007: Renu Khator appointed to a dual-role as chancellor of the University of Houston System and president of the University of Houston on October 15, 2007. 2008: Raj Chetty appointed as professor of economics at Harvard University the age of 29, one of the youngest ever to receive tenure of professorship in the Department of Economics at Harvard. He is one of the top young economists in the world. 2009: President Barack Obama appoints Preet Bharara (born in Firozpur, India; graduate of Harvard College Class of 1990 and Columbia Law School Class of 1993) as United States attorney for the Southern District of New York Manhattan. 2009: President Barack Obama appoints Aneesh Paul Chopra as the first American Federal Chief Technology Officer of the United States (CTO). 2009: President Barack Obama appoints Eboo Patel and Anju Bhargava on President's Advisory Council on Faith Based and Neighborhood Partnerships. 2010: President of Harvard University Catherine Drew Gilpin Faust appoints Nitin Nohria as the tenth dean of Harvard Business School. 2010: Year marks the most number of candidates of Indian origin, running for political offices in the United States, including candidates such as: Kamala Harris and Ami Bera. 2010: State Representative Nikki Haley is elected Governor of South Carolina, and becomes the first Indian-American woman, and second Indian-American in general to become Governor of an American state. 2011: Jamshed Bharucha named president of Cooper Union. Previous to that, he was appointed dean of the Faculty of Arts & Sciences at Dartmouth College in 2001, the first Indian American dean at an Ivy League institution, and Provost at Tufts University in 2002. 2011: Rohit Gupta wins over 100 international awards & accolades for his films Life! Camera Action... and Another Day Another Life. 2011: Bobby Jindal is re-elected Governor of Louisiana. 2012: Dinesh D'Souza directs and releases the documentary film 2016: Obama's America which is highly successful and becomes the second-highest grossing political film of all time. 2013: Hachette publishes cartoonist Francis Cleetus' compilation of It's Geek 2 Me tech toons titled "Total Timepass Tech Toons". 2014: Satya Nadella appointed as CEO of Microsoft. 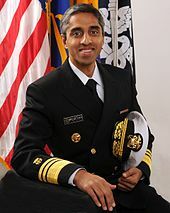 2014: Vivek Murthy appointed as the nineteenth Surgeon General of the United States. 2014: Rakesh Khurana appointed as the dean of Harvard College, the original founding college of Harvard University. 2014: Nikki Haley re-elected to a second term as the Governor of South Carolina in November 2014. She was later appointed as the US Ambassador to the United Nations, in the Trump Administration, in 2017. 2014: Manjul Bhargava wins Fields Medal in Mathematics. 2015: Sundar Pichai appointed as the chairman and CEO of Google. 2016: Pramila Jayapal, Ro Khanna, and Raja Krishnamoorthi are elected to the U.S. House of Representatives and Kamala Harris to the Senate. This puts the total number of Indian-Americans in Congress at 5, the largest in history. 2017: President Donald Trump nominates Ajit Pai as chairman of the Federal Communications Commission (FCC). 2017: Balvir Singh was elected to the Burlington County Board of Chosen Freeholders, New Jersey on November 7, 2017. He became the first Asian-American to win a countywide election in Burlington County and the first Sikh-American to win a countywide election in New Jersey. 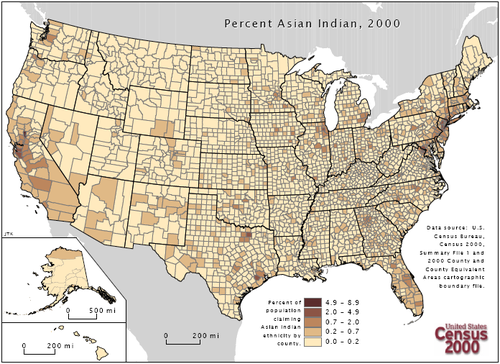 According to the official U.S. racial categories employed by the United States Census Bureau, Office of Management and Budget and other U.S. government agencies, American citizens or resident aliens who marked "Asian Indian" as their ancestry or wrote in a term that was automatically classified as an Asian Indian became classified as part of the Asian race at the 2000 US Census. As with other modern official U.S. government racial categories, the term "Asian" is in itself a broad and heterogeneous classification, encompassing all peoples with origins in the original peoples of the Far East, Southeast Asia, and the Indian subcontinent. In previous decades, Indian Americans were also variously classified as White American, the "Hindu race", and "other". Even today, where individual Indian Americans do not racially self-identify, and instead report Muslim, Jewish, and Zoroastrian as their "race" in the "some other race" section without noting their country of origin, they are automatically tallied as white. This may result in the counting of persons such as Indian Muslims, Indian Jews, and Indian Zoroastrians as white, if they solely report their religious heritage without their national origin. Unlike many countries, India does not allow dual citizenship. Consequently, many Indian citizens residing in U.S., who do not want to lose their Indian nationality, do not apply for American citizenship (ex. Raghuram Rajan). Bhagat Singh Thind, civil rights figure. In the 1980s, a gang known as the Dotbusters specifically targeted Indian Americans in Jersey City, New Jersey with violence and harassment. Studies of racial discrimination, as well as stereotyping and scapegoating of Indian Americans have been conducted in recent years. In particular, racial discrimination against Indian Americans in the workplace has been correlated with Indophobia due to the rise in outsourcing/offshoring, whereby Indian Americans are blamed for US companies offshoring white-collar labor to India. According to the offices of the Congressional Caucus on India, many Indian Americans are severely concerned of a backlash, though nothing serious has taken place. Due to various socio-cultural reasons, implicit racial discrimination against Indian Americans largely go unreported by the Indian American community. Since the September 11, 2001 attacks, there have been scattered incidents of Indian Americans becoming mistaken targets for hate crimes. In one example, a Sikh, Balbir Singh Sodhi, was murdered at a Phoenix gas station by a white supremacist. This happened after September 11, and the murderer claimed that his turban made him think that the victim was a Middle Eastern American. In another example, a pizza deliverer was mugged and beaten in Massachusetts for "being Muslim" though the victim pleaded with the assailants that he was in fact a Hindu. In December 2012, an Indian American in New York City was pushed from behind onto the tracks at the 40th Street-Lowery Street station in Sunnyside and killed. The police arrested a woman, Erika Menendez, who admitted to the act and justified it, stating that she shoved him onto the tracks because she believed he was "a Hindu or a Muslim" and she wanted to retaliate for the attacks of September 11, 2001. On August 11, 2006, Senator George Allen allegedly referred to an opponent's political staffer of Indian ancestry as "macaca" and commenting, "Welcome to America, to the real world of Virginia". Some members of the Indian American community saw Allen's comments, and the backlash that may have contributed to Allen losing his re-election bid, as demonstrative of the power of YouTube in the 21st century. In 2006, then Delaware Senator and former U.S. Vice President Joe Biden was caught on microphone saying: "In Delaware, the largest growth in population is Indian-Americans moving from India. You cannot go to a 7-Eleven or a Dunkin' Donuts unless you have a slight Indian accent. I'm not joking." On August 5, 2012, white supremacist Wade Michael Page shot eight people and killed six at a Sikh gurdwara in Oak Creek, Wisconsin. On February 22, 2017, recent immigrants Srinivas Kuchibhotla and Alok Madasani were shot at a bar in Olathe, Kansas by Adam Purinton, a white American who mistook them for persons of Middle Eastern descent, yelling "get out of my country" and "terrorist". Kuchibhotla died instantly while Madasani was injured, but later recovered. In 2009, the Department of Homeland Security estimated that there were one hundred thousand (100,000) Indian unauthorized immigrants; they are the sixth largest nationality (tied with Koreans) of illegal immigrants behind Mexico, El Salvador, Guatemala, Honduras, and the Philippines. Indian Americans have had an increase in illegal immigration of 25% since 2000. In 2014, Pew Research Center estimated that there are 150 thousand undocumented Indians in the United States. Indians are among the largest ethnic groups legally immigrating to the United States. The immigration of Indians has taken place in several waves since the first Indian came to the United States in the 1700s. A major wave of immigration to California from the region of Punjab took place in the first decade of the 20th century. Another significant wave followed in the 1950s which mainly included students and professionals. The elimination of immigration quotas in 1965 spurred successively larger waves of immigrants in the late 1970s and early 1980s. With the technology boom of the 1990s, the largest influx of Indians arrived between 1995 and 2000. This latter group has also caused surge in the application for various immigration benefits including applications for green card. This has resulted in long waiting periods for people born in India from receiving these benefits. As of 2012, over 330,000 Indians were on the visa wait list, third only to Mexico and The Philippines. In December, 2015, over 30 Indian students seeking admission in two US universities—Silicon Valley University and the Northwestern Polytechnic University—were denied entry by Customs and Border Protection and were deported to India. Conflicting reports suggested that the students were deported because of the controversies surrounding the above-mentioned two universities. However, another report suggested that the students were deported as they had provided conflicting information at the time of their arrival in US to what was mentioned in their visa application. "According to the US Government, the deported persons had presented information to the border patrol agent which was inconsistent with their visa status," read an advisory published by Ministry of External Affairs (India) which was published in the Hindustan Times. Following the incident, Indian government asked the US government to honour the visas given by its embassies and consulates. In response, the United States embassy advised the students considering studying in the US to seek assistance from Education USA. Dalip Singh Saund was the first Indian American to be elected to Congress. Nikki Haley was the 29th United States Ambassador to the United Nations. Kamala Harris was born to an Indian mother. 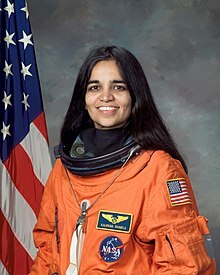 She became the first Indian American elected to serve in the United States Senate. 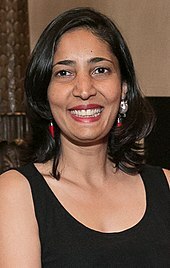 Several groups have tried to create a voice for the community in political affairs, including the United States India Political Action Committee and the Indian-American Leadership Initiative, as well as panethnic groups such as South Asian Americans Leading Together and Desis Rising Up and Moving. Additionally, there are industry groups such as the Asian American Hotel Owners Association and the Association of American Physicians of Indian Origin. A majority tend to identify as moderates and have voted for Democrats in recent elections. Polls before the 2004 presidential election showed Indian Americans favoring Democratic candidate John Kerry over Republican George W. Bush by a 53% to 14% margin, with 30% undecided at the time. The Republican party has tried to target this community for political support, and in 2007, Republican Congressman Bobby Jindal became the first United States Governor of Indian descent when he was elected Governor of Louisiana. Nikki Haley, also of Indian descent and a fellow Republican, became Governor of South Carolina in 2010. Republican Neel Kashkari is also of Indian descent and ran for Governor of California in 2014. Raja Krishnamoorthi who is a lawyer, engineer and community leader from Schaumburg, Illinois is seeking the Democratic nomination in Illinois's 8th congressional district for the United States House of Representatives. Jenifer Rajkumar is a Lower Manhattan district leader and candidate for the New York State Assembly. If elected, she will be the first Indian American woman elected to the state legislature in New York history. In 2016, Kamala Harris (the daughter of a Tamil Indian American mother, Dr. Shyamala Gopalan Harris, and a Jamaican American father, Donald Harris) became the first Indian-American and second African American female to serve in the United States Senate. The Indian American community have been significant in promoting the US-India relations. The Indian American lobbying groups have played a significant role in turning the frosty attitude of the American legislators to a positive perception about India in the post-Cold War era. For a more comprehensive list, see List of Indian Americans. ^ "ASIAN ALONE OR IN ANY COMBINATION BY SELECTED GROUPS: 2017". U.S. Census Bureau. Retrieved September 16, 2018. ^ Terrazas, Aaron (June 9, 2010). "Indian Immigrants in the United States". migrationpolicy.org. Retrieved November 9, 2016. ^ "Asian Americans: A Mosaic of Faiths". Pew Forum. July 19, 2012. Retrieved August 11, 2014. ^ a b "Pew Forum — Indian Americans' Religions". Projects.pewforum.org. July 18, 2012. Retrieved August 11, 2014. ^ Koshy, Susan. "Category Crisis: South Asian Americans and Questions of Race and Ethnicity". Diaspora: A Journal of Transnational Studies. 7 (3): 285–320. doi:10.1353/dsp.1998.0013. ISSN 1911-1568. ^ Aspinall, Peter J. (June 1, 2003). "Who is Asian? A category that remains contested in population and health research". Journal of Public Health. 25 (2): 91–97. doi:10.1093/pubmed/fdg021. ISSN 1741-3842. PMID 12848395. ^ a b c Thakur, Pradeep (2009). Indian Americans (Part 1). pp. 15–17. ISBN 978-81-908705-5-9. ^ Schultz, Jeffrey D. (2002). Encyclopedia of Minorities in American Politics: African Americans and Asian Americans. p. 284. Retrieved September 29, 2015. ^ Richard T. Schaefer (March 20, 2008). "Indian Americans". Encyclopedia of Race, Ethnicity, and Society. SAGE Publications. p. 801. ISBN 978-1-4129-2694-2. ^ a b c d Postmodernism & a Sociology...(c). University of Arkansas Press. pp. 143–. ISBN 978-1-61075-322-7. ^ "Roots in the Sand — the Archives". PBS. Retrieved February 7, 2013. ^ Jennifer Ludden. "1965 immigration law changed face of America". NPR. Retrieved December 9, 2016. ^ a b c Rangaswamy, Padma (2007). Indian Americans (2007 Hardcover Edition. ed.). New York: Chelsea House. p. 55. ISBN 9780791087862. ^ Laryssa Wirstiuk (April 21, 2014). "Neighborhood Spotlight: Journal Square". Jersey City Independent. Retrieved December 26, 2014. ^ "Yearbook of Immigration Statistics: 2012 Supplemental Table 2". U.S. Department of Homeland Security. Archived from the original on December 22, 2014. Retrieved June 1, 2016. ^ "American FactFinder — Results". Retrieved January 30, 2016. ^ "Census shows growth among Asian Indians". USA Today. May 17, 2011. ^ "ACS DEMOGRAPHIC AND HOUSING ESTIMATES 2013-2017 American Community Survey 5-Year Estimates New York-Newark, NY-NJ-CT-PA CSA". United States Census Bureau. Retrieved January 27, 2019. ^ "ACS DEMOGRAPHIC AND HOUSING ESTIMATES 2017 American Community Survey 1-Year Estimates Asian Indian alone - New York City, New York". U.S. Census Bureau. Retrieved February 11, 2019. ^ "Profile of General Demographic Characteristics: Census 2000 Summary File 1 (SF 1) 100-Percent Data". United States Census Bureau. Retrieved February 11, 2017. ^ "ACS DEMOGRAPHIC AND HOUSING ESTIMATES 2013-2017 American Community Survey 5-Year Estimates - Monroe township, Middlesex County, New Jersey". United States Census Bureau. Retrieved February 11, 2019. ^ "Supplemental Table 2. Persons Obtaining Lawful Permanent Resident Status by Leading Core Based Statistical Areas (CBSAs) of Residence and Region and Country of Birth: Fiscal Year 2014". Department of Homeland Security. Retrieved May 31, 2016. ^ "Asian Population Demographics | Largest Asian Growth". Proximityone.com. Retrieved August 10, 2014. ^ a b "America's Asian Population Patterns 2000-2010". Proximityone.com. Retrieved February 7, 2013. ^ "American FactFinder; Largest Asian Growth". US Census Bureau. Retrieved March 16, 2015. ^ "Indian-American Population, State-wise". US-India Friendship.net. Archived from the original on November 6, 2012. Retrieved November 9, 2016. ^ "U.S. Census Bureau Delivers Illinois' 2010 Census Population Totals, Including First Look at Race and Hispanic Origin Data for Legislative Redistricting". U.S. Census Bureau. Archived from the original on February 19, 2011. Retrieved February 20, 2011. ^ "Historical Census Statistics on Population Totals By Race, 1790 to 1990, and By Hispanic Origin, 1970 to 1990, For The United States, Regions, Divisions, and States". Census.gov. Archived from the original on July 25, 2008. Retrieved February 7, 2013. ^ "Yearbook of Immigration Statistics: Fiscal Years 1820 to 2006". Retrieved August 11, 2014. ^ United States Census Bureau. "US demographic census". Retrieved December 16, 2006. ^ United States Census Bureau. "US demographic census". Retrieved November 19, 2006. ^ Assisi, Francis C. (January 4, 2007). "News & Analysis: Skilled Indian Immigrants Create Wealth for America". INDOlink. Retrieved July 17, 2010. ^ Saxenian, AnnaLee (1999). "Silicon Valley's New Immigrant Entrepreneurs" (PDF). Public Policy Institute of California. ^ "The Face of Success, Part I: How the Indians Conquered Silicon Valley". Inc.com. January 13, 2012. Retrieved December 19, 2017. ^ "9 Indian CEOs in Silicon Valley Sharing Common Traits". Proactive Business Consultants. June 24, 2016. Retrieved December 19, 2017. ^ "Report: 25% of Indian B-School Graduates get a job in Americas". IANS. news.biharprabha.com. Retrieved March 19, 2014. ^ Desilver, Drew. "5 facts about Indian Americans". Pew Research Center. Retrieved January 7, 2016. ^ "USA's best: Indian Americans top community — World — IBNLive". Ibnlive.in.com. February 20, 2009. Retrieved February 7, 2013. ^ "MIT World » : The World is Flat". Mitworld.mit.edu. Archived from the original on March 28, 2012. Retrieved August 11, 2014. ^ Bouvier, Leon F. "Doctors and Nurses: A Demographic Profile | Center for Immigration Studies". Cis.org. Retrieved November 9, 2016. ^ "Indians in the U.S. Fact Sheet". POewsocialtrends.org. September 8, 2017. Retrieved January 9, 2018. ^ "Indian Immigrants in the United States". migrationpolicy.org. August 29, 2017. Retrieved December 18, 2017. ^ "Thendral.com - First American Tamil Radio". April 12, 2004. Archived from the original on April 12, 2004. Retrieved January 9, 2018. ^ "A Telugu Radio Show — Every Saturday". Google Groups. June 11, 2008. Retrieved July 17, 2010. ^ "houstonkannada.com". houstonkannada.com. Retrieved February 7, 2013. ^ "Music Videos, Reality TV Shows, Celebrity News, Top Stories | MTV". Mtvdesi.com. April 8, 2014. Retrieved August 11, 2014. ^ Frances Kai-Hwa Wang. "World's Largest Hindu Temple Being Built in New Jersey". NBC News. Retrieved January 30, 2017. ^ "So, How Many Hindus Are There in the US?" (PDF). Retrieved January 30, 2016. ^ "Composite U.S. Demographics". Adherents.com. Retrieved August 11, 2014. ^ Integrated Publishing. "Origin Of Hinduism In America". Tpub.com. Retrieved August 11, 2014. ^ "Hindu Temples in USA — HinduTemples in America". Hindutemples.us. Retrieved August 11, 2014. ^ "About JAINA". Jaina.org. Retrieved January 9, 2018. ^ "Indian Church, Churches and places of worship in the US. Asian Church in America, Indians, NRIs and Immigrants in America from Garamchai.Com". Garamchai.Com ... Retrieved July 17, 2010. ^ Arles, Siga. "Evangelism in the Changing Context of India" (PDF). Retrieved January 30, 2016. ^ "Home". F E Z A N A. Retrieved August 11, 2014. ^ "Indian Jewish Congregation of USA Newsletter" (PDF). Retrieved August 11, 2014. ^ "Welcome to Indian Muslim Council-USA". Web.archive.org. Archived from the original on October 23, 2006. Retrieved November 2, 2006. ^ Martha W. McCartney; Lorena S. Walsh; Ywone Edwards-Ingram; Andrew J. Butts; Beresford Callum (2003). "A Study of the Africans and African Americans on Jamestown Island and at Green Spring, 1619-1803" (PDF). Historic Jamestowne. National Park Service. Retrieved May 11, 2013. Francis C.Assisi (May 16, 2007). "Indian Slaves in Colonial America". India Currents. Archived from the original on November 27, 2012. Retrieved May 11, 2013. ^ The Multilingual Apple: Languages in New York City — Google Books. Books.google.co.in. Retrieved August 10, 2014. ^ Okihiro, Gary Y. (2005). The Columbia Guide To Asian American History. Columbia University Press. p. 178. ISBN 9780231115117. Retrieved May 10, 2013. ^ "Chapter 9: Home Life". Echoes of Freedom: South Asian Pioneers in California, 1899–1965. The Library, University of California, Berkeley. Retrieved January 8, 2009. ^ Frank B. Tiebout, A History of the 305th Infantry (New York: 305th Infantry Auxiliary), 431. ^ Shah, Nayan (2011). "Policing Strangers and Borderlands". Stranger Intimacy: Contesting Race, Sexuality, and the Law in the North American West. Berkeley, California: University of California Press. pp. 74–78. ISBN 978-0-520-27087-9. ^ "Roots in the Sand — Bhagat Singh Thind". PBS. Retrieved August 11, 2014. ^ "Asian Indian Women in America". Aiwausa.org. August 15, 1980. Retrieved August 11, 2014. ^ ""Mission Statement", South Asian American Digital Archive". Saadigitalarchive.org. Retrieved January 9, 2018. ^ "12th President of Cooper Union". Bharucha.org. Retrieved January 9, 2018. ^ "Indian American Arun Kumar nominated to Top White House Post". Retrieved October 6, 2013. ^ "Republican Nikki Haley wins governor race in South Carolina". The Washington Post. November 4, 2014. ^ Hefler, Jan. "Race-baiting ads backfired, says Sikh who broke barriers in South Jersey freeholder race", The Philadelphia Inquirer, November 8, 2017. Accessed December 2, 2017. ^ "State and County QuickFacts". US Census Bureau. Archived from the original on March 27, 2014. Retrieved May 10, 2014. ^ Assisi, Frank. Desparades. 2006. Are Desis White? Archived October 7, 2006, at the Wayback Machine. ^ "Raghuram Rajan taken aback by query about citizenship". Times of India. Retrieved January 9, 2018. ^ Suhr, Jim (January 7, 2004). "Hillary Clinton regrets Gandhi joke — US news — Life — Race & ethnicity | NBC News". MSNBC. Retrieved February 7, 2013. ^ "Minneapolis Temple Attack Leaves Hindu Community In Shock". Hindu American Foundation. April 12, 2006. Retrieved May 10, 2014. ^ "New Header". Kare11.com. April 14, 2006. Archived from the original on September 12, 2012. Retrieved August 11, 2014. ^ Andrew Leonard (November 9, 2006). "How the World Works: Hail Macaca!". Salon.com. ^ "Joe Biden speaks with Indian accent during speech on outsourcing\". Daily Mail. January 26, 2012. Retrieved February 7, 2013. ^ "Indian engineer killed in Kansas\". Hindustan Times. February 28, 2017. Retrieved February 28, 2017. ^ Michael Hoefer; Nancy Rytina; Bryan C. Baker (January 2010). "Estimates of the Unauthorized Immigrant Population Residing in the United States: January 2009" (PDF). DHS Office of Immigration Statistics. United States Department of Homeland Security. Retrieved March 8, 2011. ^ "Indians fastest-growing illegal immigrants in U.S". Siliconindia.com. Retrieved August 11, 2014. ^ Guillermo, Emil (December 1, 2014). "Numbers Reveal How Asian Undocumented Remain Hidden in America". NBC News. Retrieved December 2, 2014. ^ "Annual Report of Immigration Visa Applicants in the Family-sponsored and Employment-based preferences Registered at the National Visa Center as of November 1, 2012" (PDF). Bureau of Consular Affairs. United States Secretary of State. November 1, 2012. Archived from the original (PDF) on February 17, 2013. Retrieved February 5, 2013. ^ a b "'Honour your own visas,' says India as US clarifies on deportation of Indians — Times of India". The Times of India. Retrieved January 4, 2016. ^ "EducationUSA". EducationUSA. Retrieved January 9, 2018. ^ "USINPAC — US India Political Action Committee | Indian American Community". www.usinpac.com. October 31, 2011. Retrieved August 11, 2014. ^ "South Asian Americans Leading Together". Saalt.org. Retrieved May 10, 2014. ^ "Desis Rising Up and Moving". Drumnyc.org. Retrieved May 10, 2014. ^ "Desis Rising Up and Moving (DRUM) materials in the South Asian American Digital Archive (SAADA)". Saadigitalarchive.org. Retrieved August 11, 2014. ^ Ghosh, Palash (November 5, 2012). "Why Do Indian-Americans Love Barack Obama And The Democrats?". International Business Times. Retrieved May 10, 2014. ^ September 16, 2004 (September 16, 2004). "Asia Times — Asia's most trusted news source". Atimes.com. Archived from the original on September 19, 2008. Retrieved August 11, 2014. ^ "Indian immigrants' son new La. governor". Yahoo! News. Archived from the original on October 23, 2007. Retrieved October 24, 2007. ^ "Congressional bid f Indian American politician gains momentum". The Economic Times. December 29, 2015. Retrieved January 13, 2016. ^ "Record Number Of Indian-American Women Running For Public Office In 2016". Forbes. March 17, 2016. Retrieved July 8, 2016. ^ "PM Golding congratulates Kamala Harris-daughter of Jamaican - on appointment as California's First Woman Attorney General". Jamaican Information Service. December 2, 2010. Archived from the original on January 15, 2012. Retrieved February 2, 2011. ^ "California Attorney General Kamal Harris marries Douglas Emhof". The American Bazaar. September 2, 2014. ^ Staff, CalWatchdog (April 7, 2013). "Why Kamala Harris is probably not thrilled with compliment". CalWatchdog.com. ^ "Election Day 2016 updates: Trump defeats Clinton to become next president of U.S." Latimes.com. Retrieved January 9, 2018. ^ "Kamala Harris is elected California's new U.S. senator". LA Times. Retrieved November 9, 2016. ^ "Indian Lobbying and its Influence in US Decision Making - SAGE Publications Inc". Us.sagepub.com. Retrieved January 9, 2018.